You are about to learn the long suppressed secrets to complete health many of which cost almost nothing to implement and, in very many cases, will also rapidly show a direct cash benefit! firstly, I would like to introduce myself to you. 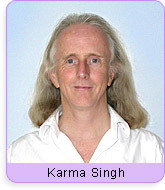 My name is Karma Singh, a citizen of Great Britain and a professional healer for more than 24 years. You can read more of my story on my personal website here. It is not only during my professional career but also during my 13 years training and studying prior thereto that I have again and again been confronted with the fact that the overwhelming majority of so called medical treatments seem to be aimed very specifically at preventing health! At present, the book is not available in a printed form. All languages and editions are available as pdf downloads directly from the website. Following the success of this book, I asked my entire mailing list whether there were other problems to which they would wish a real solution. The response was the largest "postbag" of my life! It seems to me that there is a demand for useful information about the origins and solutions to a large number of common (mostly health) problems. Many such problems can be very easily and cheaply removed from your life if you just knew how. In most such cases, the solutions are well known but not made generally public simply because, for the vast majority of such solutions, the medico-pharmaceutical industry could not earn a single penny so they not only don't tell you, they spend a lot of money to prevent your access to them. Well, here they are. All are download files, i.e. instantly available. Getting and being healthy is neither difficult nor expensive. You just need to know how. That's all. There has been, for most of the last 100 years, vast sums of money invested in suppressing this knowledge. It is only by keeping this knowledge from you that the medico-pharmaceutical industry has become the richest industry in the world. The pharmaceutical companies have become so rich at the expense of your health that their economic size enables them to dictate government policy in the USA, in Canada, in Germany and, probably, several other countries. The pharmaceutical companies have recently purchased legislation in the USA and Canada to make the (much safer and often more effective) non-pharmaceutical remedies illegal. Some three years ago they also succeeded in purchasing the same legislation in Europe but, at the last minute, the European Court declared such legislation to be illegal. In these books, handbooks and audio files in the library is the detailed knowledge which almost anyone can apply themselves with not the slightest need to involve either massively overpaid “experts” nor yet to purchase incredibly expensive quack nostra to neutralise what has been done to you and your family for profit. I decided to make these available at the lowest possible cost compatible with creating and maintaining the requested handbooks. dependent upon where you live. Hence the name "5 4 3 Bookshop". Some, however, are much larger files and may cost up to $19.97. If you are in our mailing list – you may join by clicking this link – then you will automatically receive notification of new publications as they become available. All are pdf and/or MP3 downloads instantly available, delivered right now directly to your computer. "A History of Medicine from 1484 to the Present Day"
Approximately 1 in 20 requests for downloads of articles etc. and/or registrations for the newsletter fail due either to a mis-spelling in the email address or problems with the email provider (most commonly hotmail). We ask you, therefore, to provide a valid telephone number where we can contact you in the event of such a failure. This number will ONLY be used for this purpose - we dislike telemarketers at least as much as you do and will always do our best to protect our subscribers from them! rented, hired, sold or in any other way passed on to third parties.